Some 50 people gathered outside the Sungai Buloh Prison today to celebrate the 68th birthday of jailed former opposition leader Anwar Ibrahim. 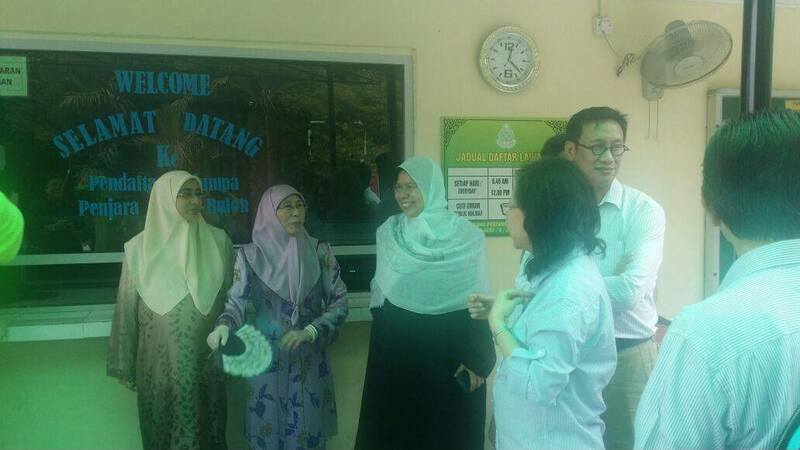 Among those in attendance were Anwar’s wife and PKR president Dr Wan Azizah Wan Ismail and their five daughters. 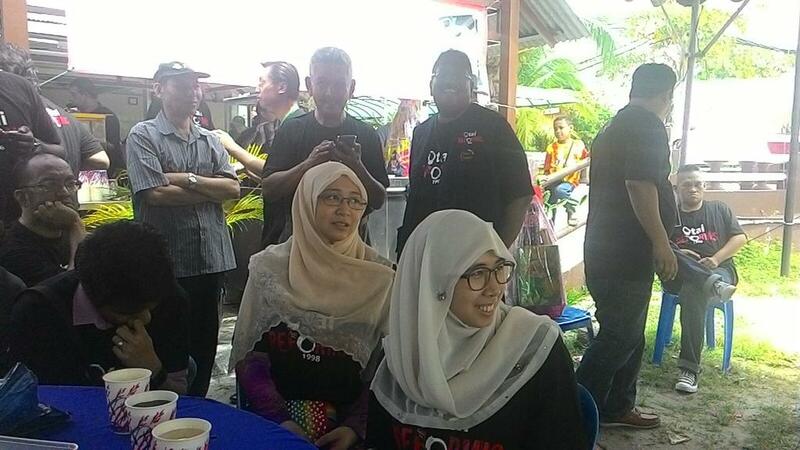 Also present were PKR vice-presidents Tian Chua and Rafizi Ramli, and the party’s Wanita chief Zuraida Kamaruddin. 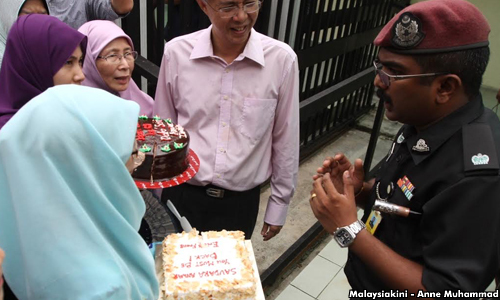 The crowd, who sang Happy Birthday and Allah Selamatkan Kamu (God save you) for Anwar from outside the prison gates, also brought three birthday cakes and a giant postcard signed by supporters. Anwar Ibrahim’s daughter laments his incarceration ahead of his 68th birthday and is heartbroken the family have not secured his release yet. 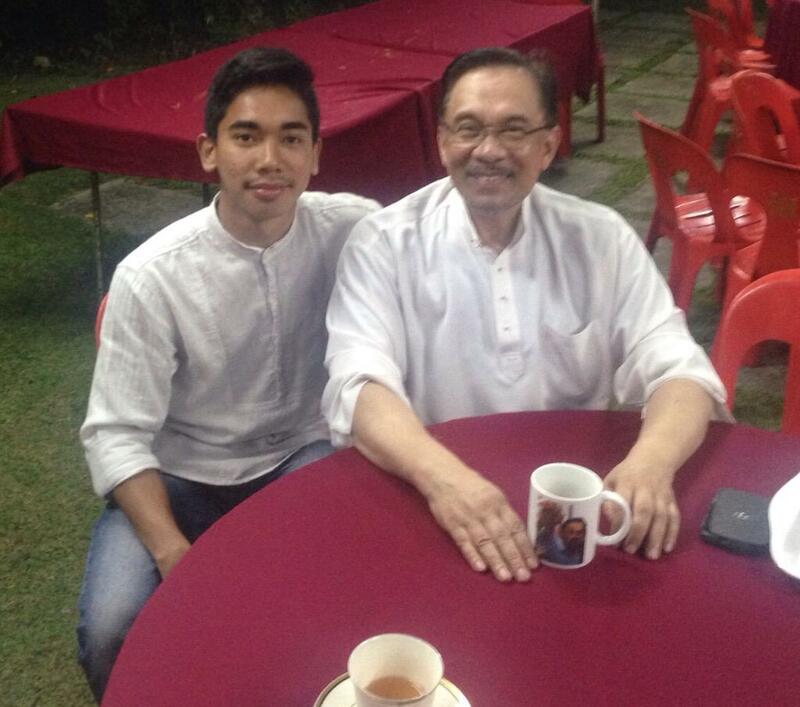 KUALA LUMPUR: Today is the 68th birthday of former Opposition leader Anwar Ibrahim, and his eldest daughter is heartbroken the family has not succeeded in securing the release of the former Opposition leader yet. “Solidariti #March2Freedom #BebasAnwar di Sg Buloh. Selamat Hari Lahir Papa. 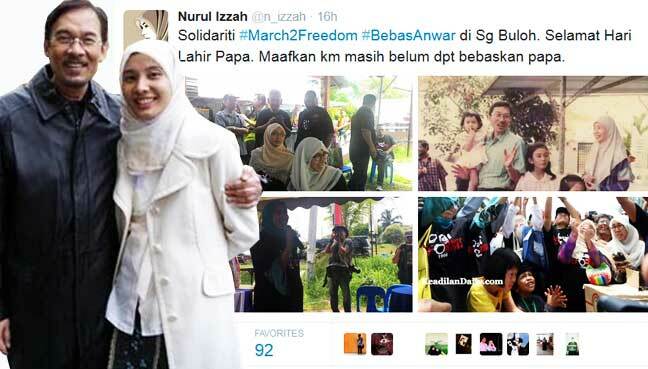 Maafkan km masih belum dpt bebaskan papa,” said Lembah Pantai MP Nurul Izzah Anwar on her Twitter yesterday. This was posted after she, her siblings Nurul Iman Anwar and Nurul Hana Anwar, including several Opposition leaders gathered outside Sungai Buloh Prison in a show of solidarity for her incarcerated father. 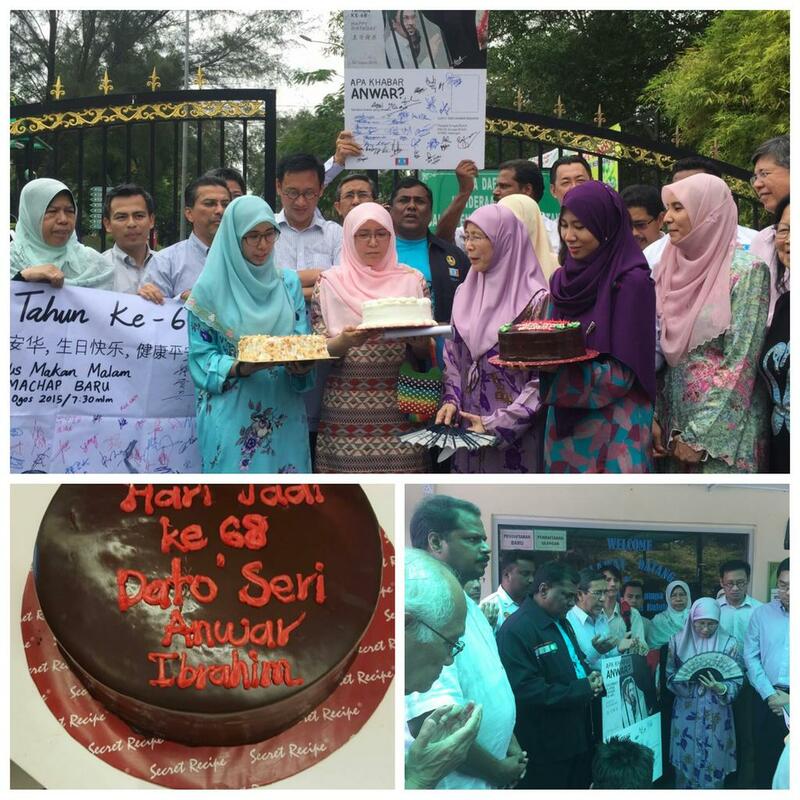 Daughters of @anwaribrahim with Reformis gather outside Sg Buloh Prison to express our solidarity on Anwar birthday. 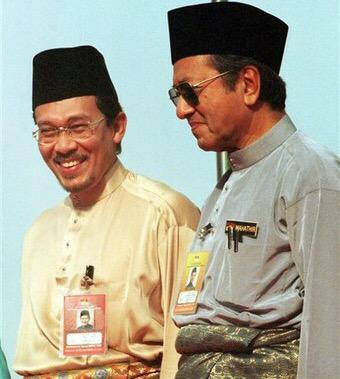 Selamat hari lahir @anwaribrahim. Walau apa pun kritikan aku @Suara_generasi Mahathir dan Anwar gandingan terbaik! Happy Birthday to a Brave Front Line Soldier captured & held behind enemy lines. 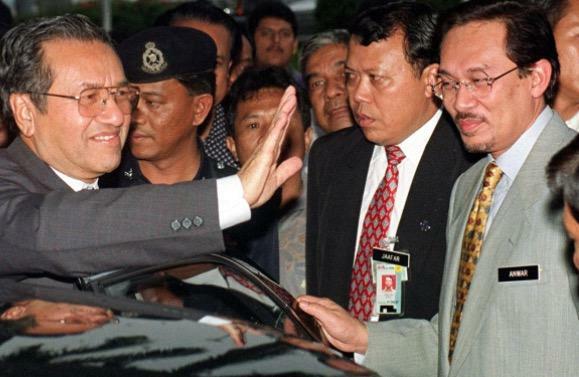 Keep your spirits up @anwaribrahim ! 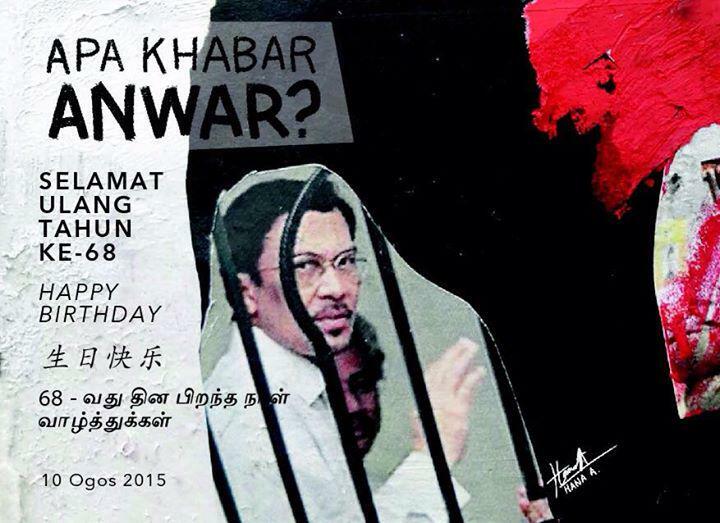 HOW DO YOU BUY AN ANWAR BIRTHDAY POSTCARD? 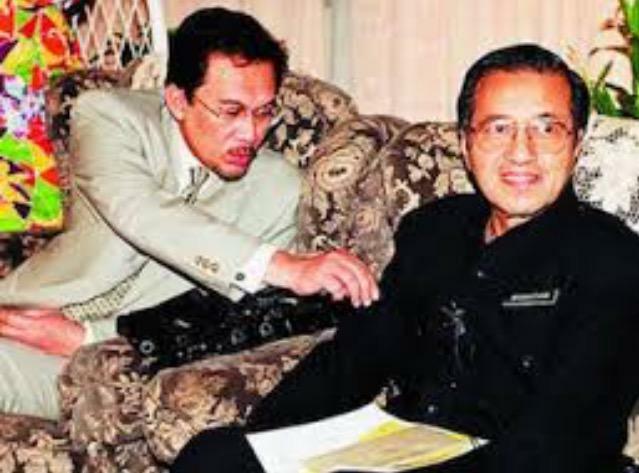 Bersempena hari lahir Dato Seri Anwar Ibrahim yang menjelang tiba pada 10/8/2015, hantarlah satu poskad ucapan hari lahir sambil menyumbang untuk perjuangan menegakkan keadilan di tanah air tercinta. Dengan sumbangan RM50 atau lebih, anda boleh menghantar sepucuk poskad khas kepada Datuk Seri Anwar Ibrahim di penjara Sungai Buloh. Pembayaran boleh dibuat ke akaun Parti Keadilan Rakyat (5641 9102 5409) Maybank. Minta sebarkan dalam Facebook & media sosial. @n_izzah My wallet is willing but how to pay for #AnwarBirthdayPostcard? @simtzetzin How to buy anwar’s birthday postcard? A contribution of RM50 or more will get you a postcard. PKR will bring the postcards to Sugai Buloh Prison next Monday, 10 August, when Anwar is 68. 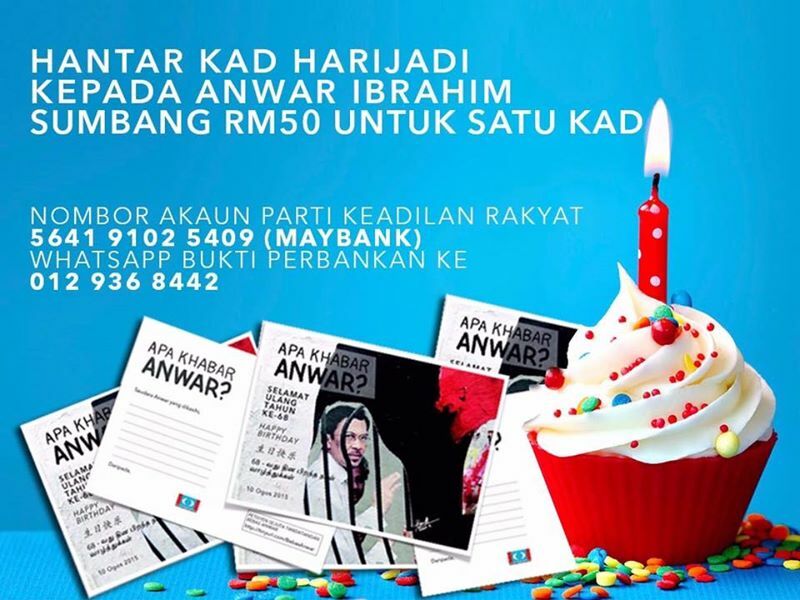 PKR has urged the public to donate by buying postcards for its de facto leader Anwar Ibrahim’s 68th birthday. “We have prepared 1,000 birthday postcards and the public can contribute RM50 or more for a postcard,” said PKR director of strategy Sim Tze Tzin. 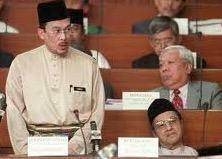 “We urge the rakyat to show their affection and loyalty to Anwar Ibrahim,” he said in a press conference. “We want the rakyat get to get used to making small contribution in the name of political funding, so they are sensitive to political developments,” he said. “We have only received RM300 at present. To achieve RM2.6 billion, we need 52 million donors,” he said sardonically, referring to the RM2.6 billion donations that went into Prime Minister Najib Abdul Razak AmBank accounts. This entry was posted in anwar ibrahim, birthday postcards for anwar, happy birthday anwar ibrahim, nurul izzah, PKR and tagged anwar ibrahim, birthday postcards for anwar, happy birthday anwar, Nurul Izzah. Bookmark the permalink.